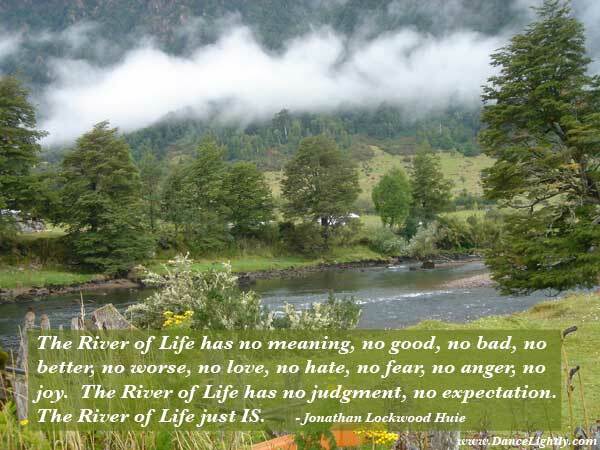 The River of Life has no meaning - no good, no bad, no better, no worse, no love, no hate, no fear, no anger, no joy. The River of Life has no judgment, no expectation. The River of Life meanders without apparent purpose. To question Life is to invite suffering. To attempt to overpower Life is to tilt at windmills. Life is best enjoyed without resistance. Surrender to the flow of the River of Life, yet do not float down the river like a leaf or a log. While neither attempting to resist time nor to to hurry it, become the rudder and use your energy to correct your course to avoid the whirlpools and undertow. The River flows with no concept of good and bad – right and wrong. The River can cut through solid rock – in its own time. The River of Life is not powerful – and it is not weak. The River of Life is not gentle – and it is not strong or rough. The River is the source of all life – the source of all death. The River is the source of all joy – and the source of all sorrow. Yet the River has no joy – and the River has no sorrow. One can flow harmoniously with the River – or one can struggle fearfully against the River - and the River just flows. One can accept the River – or one can deny the River – and the River just flows. One can worship the River of Life – or one can curse the River of Life – and the River just flows. There is nothing to do – and the River flows. There is nothing to say – and the River flows. There is nothing to think – and the River flows. There is nothing to feel – and the River flows. The River flows – and all else is our drama. The River flows – and all else is our invention. I like this poem very much! I, too, choose to flow with the River of Life.